Pioneering Architect Philip Johnson Dies Robert Siegel talks to critic Paul Goldberger of the New Yorker about architect Philip Johnson, who died at the age of 98. Johnson was a promoter of the "glass box" skyscraper and designed the AT&T Building in New York. Robert Siegel talks to critic Paul Goldberger of the New Yorker about architect Philip Johnson, who died Tuesday night at the age of 98. Johnson was a promoter of the "glass box" skyscraper. 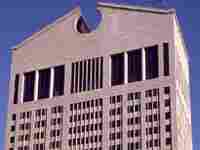 He designed California's Crystal Cathedral, and the AT&T Building in New York. Goldberger says Johnson was not necessarily the greatest architect, but was an influential force as "the greatest advocate of architecture as art." Goldberger is also author of the book Up from Zero: Politics, Architecture, and the Rebuilding of New York.